Flash your 11B and SAFRA card to enjoy these delightful Yum Cha promotions for all NSmen and SAFRA card members! 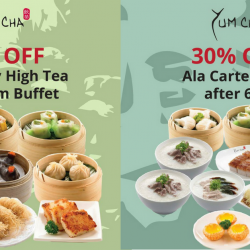 Enjoy 30% OFF Weekday High Tea buffet at Yum Cha Chinatown only or 30% OFF Ala Carte items after 6pm at Yum Cha Changi only. 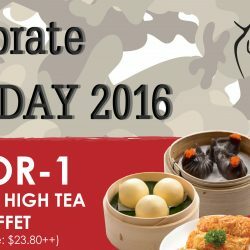 To commemorate SAF day, starting from today, Yum Cha Restaurant is giving all SAF personnel (NSFs, NSmen, Regulars) 1 for 1 Weekday High Tea buffet for the first 10 servicemen daily and 20% OFF buffet price for subsequent servicemen, for the whole month of July! Just show up in your uniform or flash your 11B to enjoy the discount!